2. Roll out the pastry into a rectangle approximately 35cm x 20cm in size with the longest side closest to you. 3. To make the trunk, cut a 3cm wide vertical strip at the edge of the pastry and roll the strip towards you. 4. Spread the mince meat evenly across the remaining pastry and roll the pastry towards you, starting at the side furthest away. 5. Use a sharp knife to cut the pastry evenly into 15 small rolls. 6. Line a baking tray with parchment paper and arrange the 15 rolls on the tray in a tree formation, with five at the bottom, four on the next layer, then three, then two and finally one on the top. Leave a small amount of room between each roll so they have space to rise in the oven. Remember to add the trunk at the bottom of the tree. 7. Brush the tree with almond milk. 8. Place in oven for 10-15 minutes. 9. Meanwhile, make the glaze by heating the jam and water for a 1-2 minutes in a pan until it becomes runny enough to paste on the tree. 10. Remove the buns from the oven, brush with the jam glaze and leave to cool completely. 11. 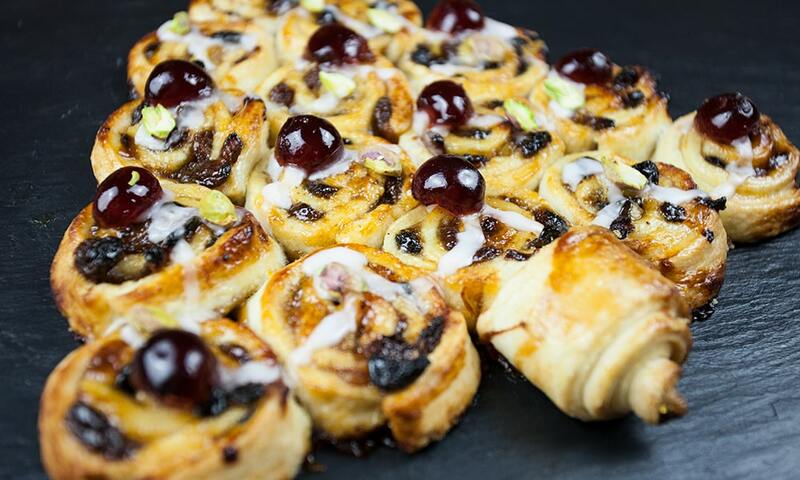 To decorate, combine the icing sugar and water until smooth and drizzle or pipe over the tree, then top with halved glacé cherries and chopped pistachios. This looks so yummy plus easy to make. Definitely going to make this. I used to like eating mince pies but haven’t since going vegan. Thanks for the recipe.